"An enlightening, A-to-Z look at what indexing involvesâ€”including the tools of the trade, the many technical and lifestyle challenges indexers face, and what it takes to become a successful indexer." 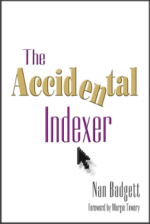 With The Accidental Indexer, Nan Badgett has written the definitive guide to the indexing profession. Badgett presents a clear-eyed overview of the field, describes a range of specialties, shares insights from her fellow â€œaccidentalâ€� indexers, and offers a wealth of savvy advice on starting and running a freelance indexing business. Youâ€™ll find strategies for staying on deadline, maintaining workâ€“life balance, collaborating and subcontracting, and creating new work opportunities. In addition, Badgett recommends important resourcesâ€”and provides useful forms and checklistsâ€”on such topics as training and professional development, promoting your services, managing multiple projects, contracting with clients, and ensuring index quality. "A wonderfully informative overview of the rigors and rewards of the indexing profession and of the independent, intelligent people who practice it." "All new indexers should have two books on their shelf: Mulvanyâ€™s and Badgettâ€™s. That dynamic combination covers all the basics of how to index and how to begin an indexing career."